Beloved by millions of readers, The Good Earth has been one of the most popular novels of this century since its publication in 1931. The book won the Pulitzer Prize and the William Dean Howells medal for fiction. For over 30 years, Pearl S. Buck's novel played a major role in shaping Western attitudes toward China. 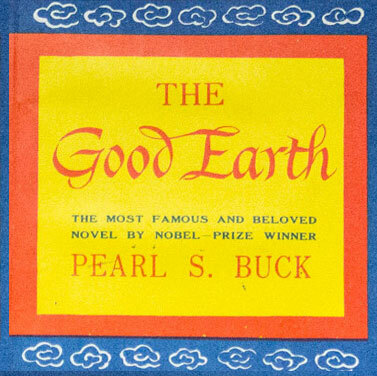 Buy Pearl S. Buck books online! Born in Hillsboro, West Virginia, in 1892 to an ill-matched pair of Southern Presbyterian missionaries, Pearl Sydenstricker was taken to China at the age of three months and lived there for forty years. A rarity among white American writers, she spent her childhood as a minority person, an experience that had much to do with her lifelong passion for interracial understanding. Raised in Chinkiang, a small port city in Kiangsu province, by the time she was four she spoke and wrote Chinese as well as English. Upon her mother's insistence, Pearl was educated at Randolph-Macon Women's College in Lynchburg,Virginia. In 1917 she married Lossing Buck, a Cornell Graduate working in China, and spent the next several years in Nanhsuchou, a barren rural village, home to several thousand impoverished farmers. She became intimately familiar with the daily lives of China's poorest inhabitants, and a decade later the village would provide the primary setting for her first stories of China, including The Good Earth. She would publish over seventy books during her long, productive career, including many bestsellers, but The Good Earth would prove to be her most enduring. In 1935, Pearl divorced Lossing Buck in order to marry her publisher and editor, Richard Walsh. They moved to Green Hills Farm in Bucks County, Pennsylvania. In 1938 she became the first American woman to win the Nobel Prize for literature; it would be fifty-five years before another, Toni Morrison, would win. In essays, lectures, and novels, she was an active supporter of the Chinese in their war against Japenese invasion. She and Walsh raised millions of dollars that were sent to China for medical relief. Along with her tireless efforts on behalf of the Chinese, Pearl was also active in the campaigns for African-American civil rights, the equal rights amendment, and a nuclear test ban. After World War II, she found herself under attack by Senator Joseph McCarthy and other right-wing politicians for her liberal views, and became a target of F.B.I. surveillance which began in 1938 and continued to the end of her life. In 1949, Pearl founded Welcome House in order to find homes for thousands of mixed-race children who had been fathered by American Servicemen in Asia. In the last twenty years of her life, she established the Pearl S. Buck Foundation to provide foster care for Asian-American Children who could not be adopted by American families. Eventually she moved to the small New England town of Danby, Vermont where she died in 1973 at the age of eighty. Pearl lived half her lifetime in the East, half in the West. She began in poverty and ended her life as a millionaire, along the way winning the most coveted literary prize in the world. She played a leading role in major twentieth-century struggles for human rights and established herself as one of the most powerful women of the century. In all of this, she left a legacy far larger than her classic novel,The Good Earth, and her other writings. She is buried as she had instructed, at Green Hills Farm, beneath a large ash tree. Her tombstone, which she designed, does not record her name in English; instead the Chinese characters representing the name Pearl Sydenstricker are inscribed. The Stulting family was very learned, and for the most part self-taught. In the music room, they maintained a very comprehensive library. When the family was on furlough in Hillsboro, Pearl read their selection of Charles Dicken's novels, often sitting on the second floor porch. Did you know that the museum sells Pearl Buck books?